Congratulations on a wonderful concert this past week at Johnson Ferry Baptist Church. I hope you enjoyed the concert as much as I did! So proud of you all!!! Due to the number of students performing at LGPE this week, we will not rehearse this week (March 11th). We will start rehearsals for our final concert of the season on Monday, March 18th at NAHS. Best wishes to all at LGPE! Our second MAYWE concert of the season will be held on, Monday, March 4, 2019 at 7:30 p.m. at Johnson Ferry Baptist Church. The address is 955 Johnson Ferry Rd, Marietta, GA 30068. We have been working very hard and have a wonderful program planned for you. We hope that many parents, relatives and friends are able to attend. There is no charge to attend. Please find concert details below. Please read these very carefully and feel free to contact us if you have any questions. Concert call time is6:15 p.m. SHARP on Monday. Traffic will likely be worse at this hour than at our usual start time of 7:00. Please leave as early as you possibly can. This is our dress rehearsal and it is expected that all musicians will be punctual. If you have an unavoidable issue that prevents you from being there at 6:15 you must e-mail Kim Everett (mayweinfo@gmail.com) immediately. Students should arrive in concert dress, as there will not be a place to change. The concert dress requirements have been pasted at the end of this e-mail for your convenience. Parking:You can park in the spots on the north side of the sanctuary. Please enter from the front of the Sanctuary (look for the steeple). The concert begins at 7:30pm. Please wait in the lobby; doors for admission into the theater beginning at 7:15pm. . There are many food and coffee establishments in the area if parents wish to wait prior to the concert. There is absolutely no audiotaping, videotaping or picture taking of any kind allowed during the concert. To avoid a potentially uncomfortable and public situation, it would probably be best to leave cameras and video cameras at home. The goal of the ensemble concert dress policy is to present to the audience a unified and professional appearance. Any member who comes to a performance in unacceptable attire will not be allowed to perform until the attire conforms to the concert dress policy. The governor has closed state offices for tomorrow thereby causing many metro school closures for tomorrow due to weather concerns. Related to the school closings, many students have emailed indicating that they will not be at rehearsal tonight; therefore we will not be able to rehearse tonight Jan. 28, 2019. We are excited about the upcoming season of MAYWE. Congratulations to the outstanding group of musicians who auditioned. Email letters of acceptance have been sent to the student email accounts submitted on their registration form. Alternates were assigned and will be contacted once any positions open in the coming days. Please follow all directions provided in the acceptance email. We are so excited that you are auditioning for the 15th season of the Metropolitan Atlanta Youth Wind Ensemble in a desire to join students from around the Atlanta-metro area who are MAYWE. Students should prepare approximately 3 total minutes of music of two contrasting styles from standard repertoire for their instrument. See the audition information located at maywe.org for specific requirements. **Audition fee of $25 is due upon check in for your audition. Payment may be made in the form of cash (exact change only), credit card or personal check made payable to Vision Publications/MAYWE. We are pleased to announce that MAYWE will be rehearsing weekly at North Atlanta High School. Auditions will be held in the performing arts wing of the NAHS campus. Follow the building signs for the THEATER. A MAYWE representative will greet you at the registration table and direct you to the warm up and audition rooms. We recommend that you arrive at least 30 minutes before your scheduled audition time in order to park and warm up. North Atlanta High School is conveniently located just off the I-75 and Mt. Paran Road. The street address for GPS use is 4111 Northside Pkwy NW, Atlanta, GA 30327. Please park in the parking deck and proceed across the bridge to the performing arts center. VERY IMPORTANT: If you will be traveling on the I-75 so please check current delays and travel times the day of your audition at www.georgia-navigator.com. ; Please allow for adequate travel time. Please email us at mayweinfo@gmail.com if you have any questions. 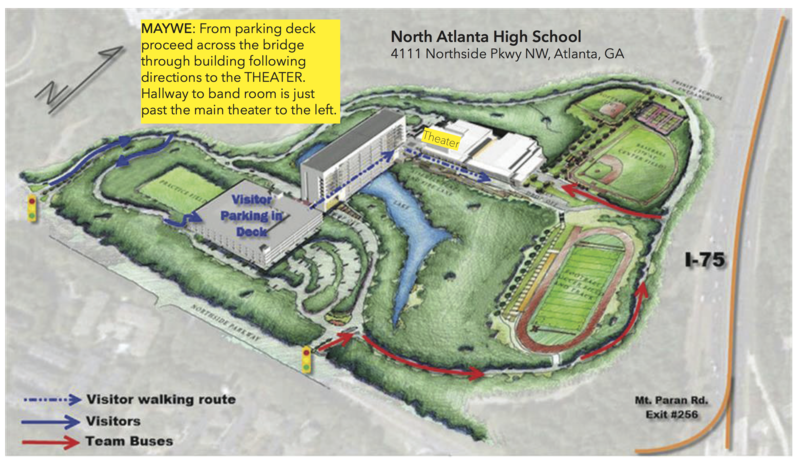 We are pleased to announce that MAYWE will be rehearsing weekly at North Atlanta High School. Auditions will be held in the performing arts wing of the NAHS campus September 9-11th. Online registration and audition sign-ups open August 26. VERY IMPORTANT: If you will be traveling on the I-75 so please check current delays and travel times the day of your audition at www.georgia-navigator.com. Please allow for adequate travel time. For Audition Information, click here. To register for an audition, click here.